Now and then a person’s ears need some loving, so this week I took both of them to Texas for a vacation. They are now happier than a dog with a dead skunk. Everywhere I take my two ears, I hear people using Texas’ most personal pronoun, “y’all,” which like the humdrum pronoun “you” can be either plural or singular. (Note to you grammarians and punctuationists out there: I know some of you write the possessive for Texas with an extra “s” as in “Texas’s most personal pronoun.” However, I don’t like it and if I see it I’m likely to ask you to move your “s” elsewhere.) My heart’s been soothed hearing people speak proper and without those accents the Yankees are so fond of. I have been traveling with my daughter and grandchild visiting family in Houston, basking in hot and humid weather and enjoying every minute of it. That’s what Wisconsin’s 9-month winters will do to a person. Houston is a great big old city built on a bayou. Unless you are from the South, you may not know that “bayou” is a fancy name given to rivers and ditches to make songs more interesting. Just imagine if the refrain in Hank Williams’ song Jambalaya “Son of a gun we’ll have big fun on the bayou” were “Son of a gun we’ll have big fun at the ditch.” It just don’t sound right and kind of makes your toes stop tapping right in the middle of the song. And yes, that “don’t” is there on purpose, thank you very much. Houston has set up home near the Gulf of Mexico and southeast of the heart of Texas, so I believe it’s appropriate to consider it the spleen of Texas. Spleens store and filter blood, and Houston does the same with oil, which is pretty much the blood of our nation, so the analogy seems to fit. I have never lived in Houston myself, but if I did and if I had a son, I would name him Billy Rueben just because it would tickle me every time I thought of my sweet Billy Reuben living in the spleen of Texas. Today we return north. I sure do hope they didn’t have summer while we were gone. I’d hate to miss it. 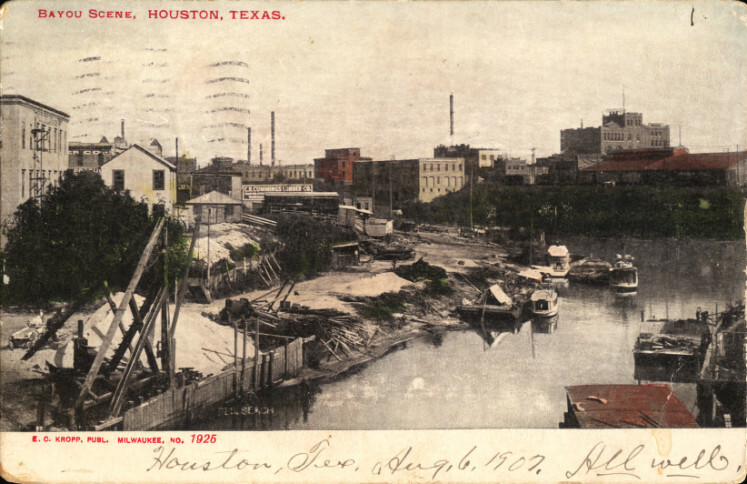 Photo: Courtesy of Special Collections, University of Houston Libraries. Like a couple of old but still valuable coins, my brother and I were collected from our Killarney hotel at 7 a.m. by a man in a van. He drove us to Limerick to meet up with the tour bus. Someone else got the seats in the first row, so we sat on the left in the second row. I know the hung-over man in the front seat appreciated having such a nice view to sleep through on most of the tour. We contented ourselves with seeing what was left. 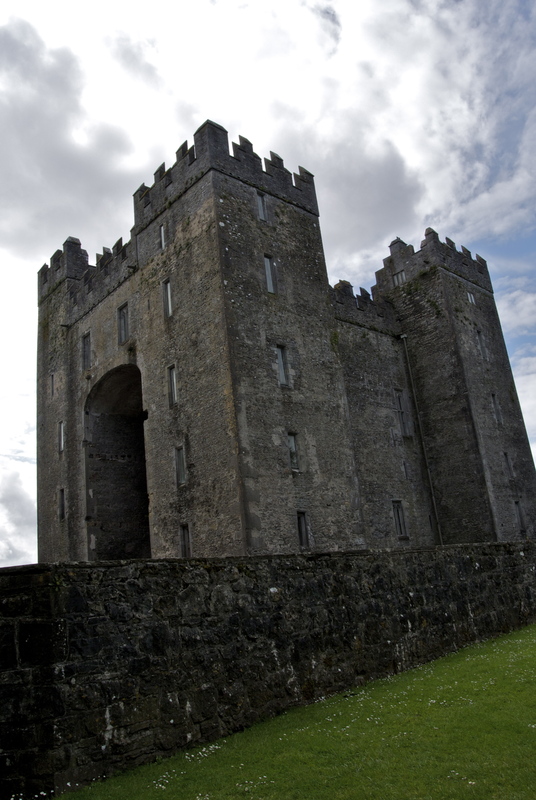 Bunratty Castle has experienced a number of ups and downs since 1270 when Robert De Muscegros built the first fortress near the Ratty River. Literal ups and downs. After being raised, razed, and ruined (history’s three R’s) for almost 700 years, Standish Robert Gage Prendergast Vereker took on the daunting task of shortening his name to 7th Viscount Gort. He then restored and refurbished the castle (in 1954) so tourists would have some interesting places to leave their money when visiting Clare County. It worked. 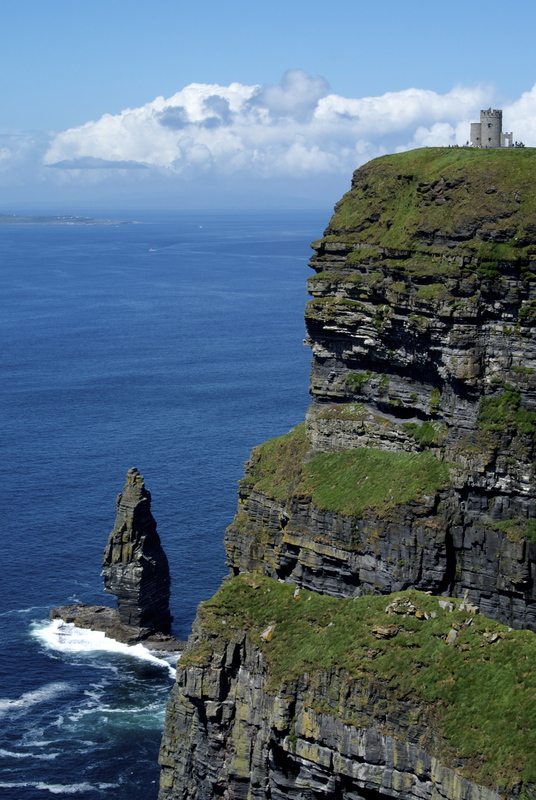 Tourists visit Clare County, they leave their money there, and they find it interesting. As was, is, and ever will be my wont, I gawked a lot. Viscount Gort furnished the castle with medieval furniture and tapestries, and visitors are free to roam about and try to remember to take some pictures. Tapestries from the 15th century and antlers of giant deer decorate the walls of the Great Hall. 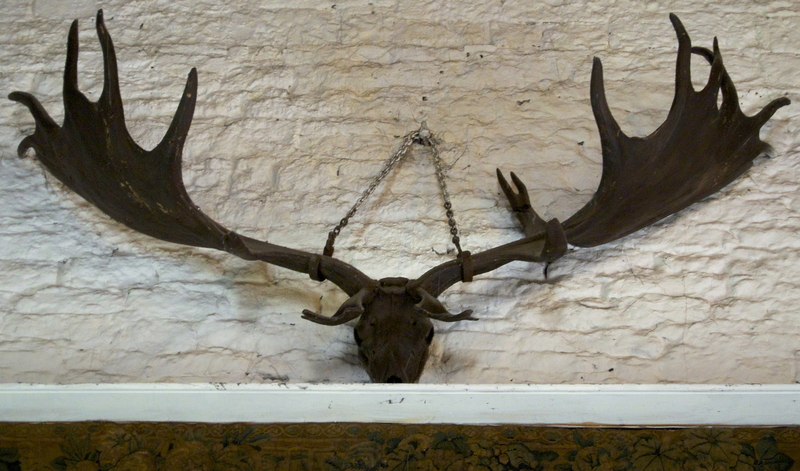 Giant deer with antlers up to 24 feet wide once roamed the Irish countryside. Thankfully, some of them died in bogs, those Irish scrapbooks of early history. The folks who run Bunratty Castle not only let you photograph whatever you want, but they also have a website that shows the Bunratty collection. How’s that for Irish hospitality? After visiting the castle we wandered through the folk village on the castle grounds. We didn’t have enough time to see all of the grounds because we needed to head to our next stop. 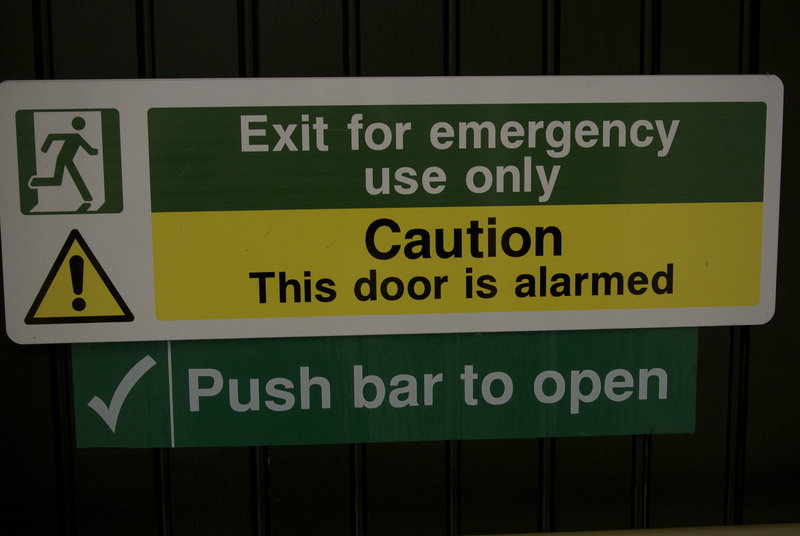 I never found out what this door was alarmed about. 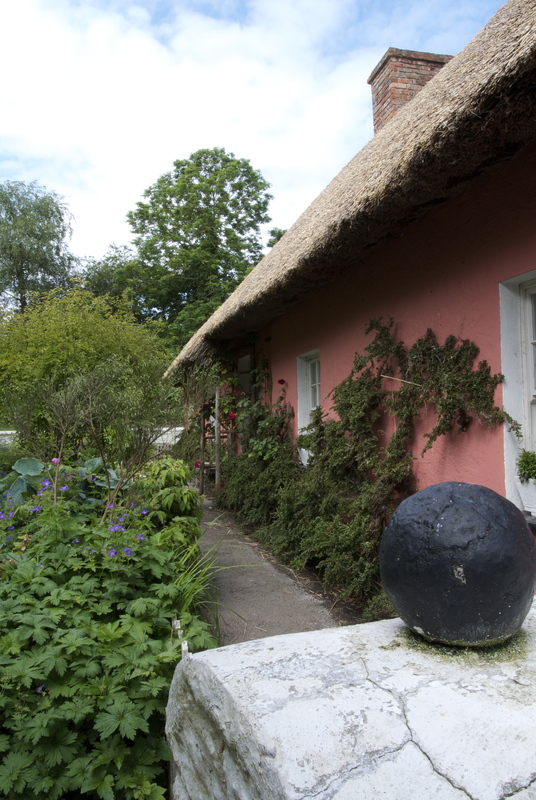 I wasn’t alarmed even once at the Bunratty Folk Village. 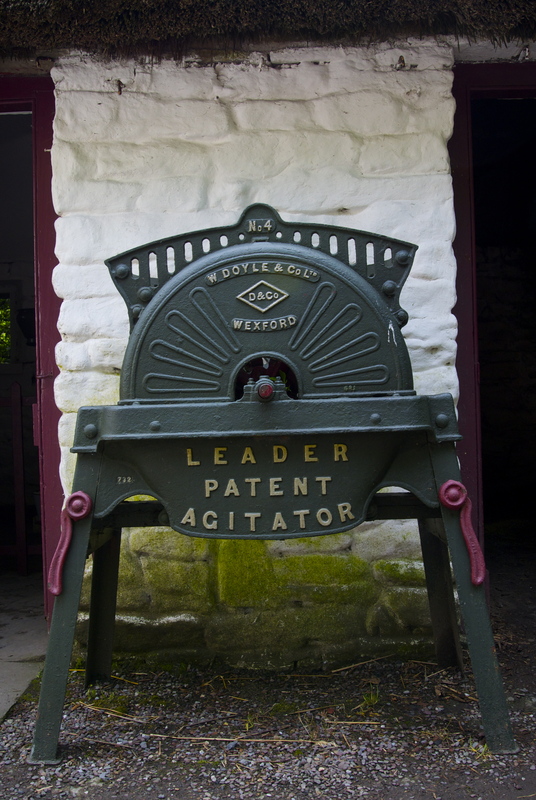 I saw this Irish agitator at Bunratty Castle. On our last day, the weather turned warm and sunny, mostly. To the southwest, some kind of cloud convention was going on, but they hung around the horizon and didn’t head our way. The bus driver said the tour group on the previous saw little of the Cliffs because of the fog. When we un-bused, everyone un-sweatered themselves, and headed lemming-like toward the cliffs. In spite of the grand weather, I managed to take quite a few bad pictures, but also captured some with a ridiculously blue sky and sea. Part of the cliffs were cordoned off to make sure the tourists go over to that part. We made sure to do so ourselves. 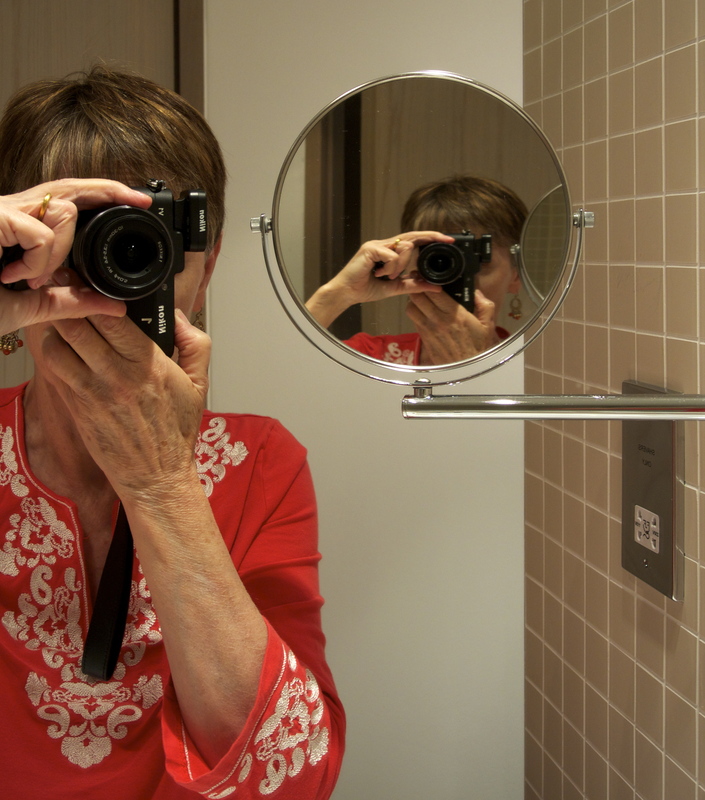 I made both my camera and purse hold my hand but managed to lose my coral windbreaker, which I had slung over my purse because it was a one-shirt day. Thankfully the windbreaker didn’t jump over the Cliffs; it just jumped down on a walkway to get a closer look. Before we left, I checked the lost and found, and someone had turned it in. 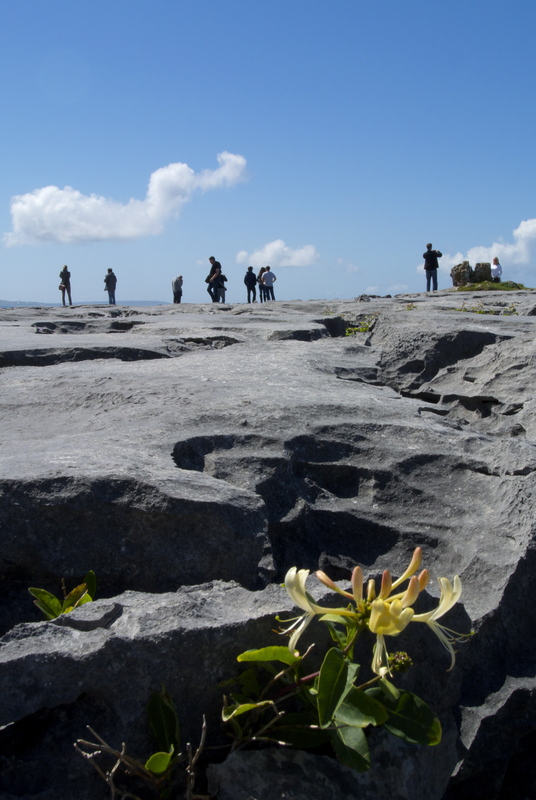 As we headed for Galway to catch our train back to Dublin, we stopped at The Burren, which means “rocky place” in Gaelic. Geologists, scientific Rock Stars, call the limestone landscape ‘karst’: a rocky place full of fissures, cracks, caves, and sinkholes, which sounds remarkably like my brain. 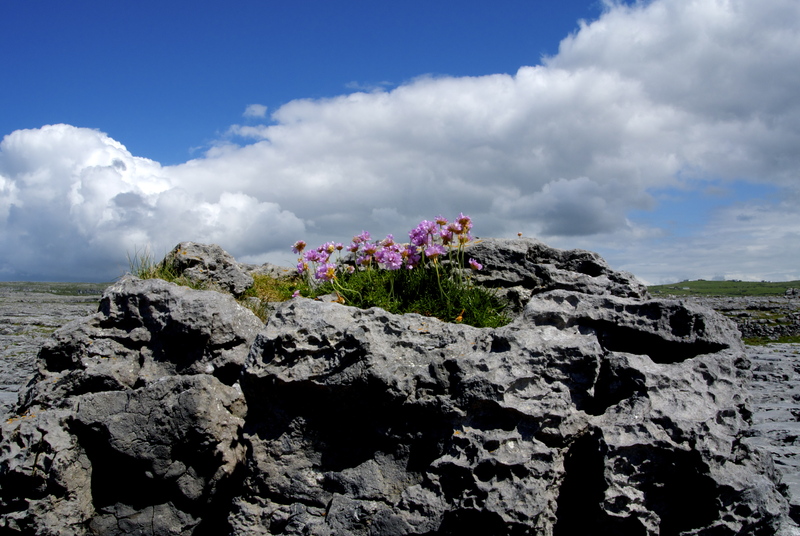 Unlike politicians, you can’t find much dirt in the limestone bedrock, yet it hosts over 700 species of plants, both those that grow in arctic and alpine areas of the world and those more typically found in the Mediterranean. As our bus hurtled forward to Galway on the motorway, the driver pointed out a fairy tree on our left. He even slowed down a bit and explained that the controversy over moving the fairy tree had delayed the building of the roadway for ten years. In the end, the tree won, the non-fairies rerouted the roadway, and the Irish moved on to other controversies. Since I was sitting on the left, I had a clear shot of the tree, which I didn’t get. I’m still mastering the skills of photography: digging in my bag for the camera, turning on the camera, looking through the viewfinder, seeing total blackness, removing the lens cap, looking through the viewfinder again, and trying to remember how to adjust the f/stop, shutter, aperture, and speed dial. If you want to see the tree of controversy, you have to visit someone else’s blog, someone like Paz, who obviously has mastered that tricky speed dial on his camera. In Galway, my windbreaker, tried of being slung over my purse, left me again, seeking solace in the arms of a stranger. If you happen to be Galway and see someone wearing a coral windbreaker, say hi for me, and tell it I’m sorry. Thankfully we picked up something to eat on the train because when we got to our downtown Dublin hotel, it was after 9 p.m., and we couldn’t find a place to eat. Like a bowl of Lucky Charms slurped down by an adult who should know better, our time in Ireland was swallowed up by the calendar. My brother left Dublin the next morning to return to Budapest, and I retraced my route via ferry and train back to London to a hotel near Heathrow. The following day I flew back to the States and stepped off the plane into the waiting arms of the TSA, and finally my husband. Bogged down in Ireland? 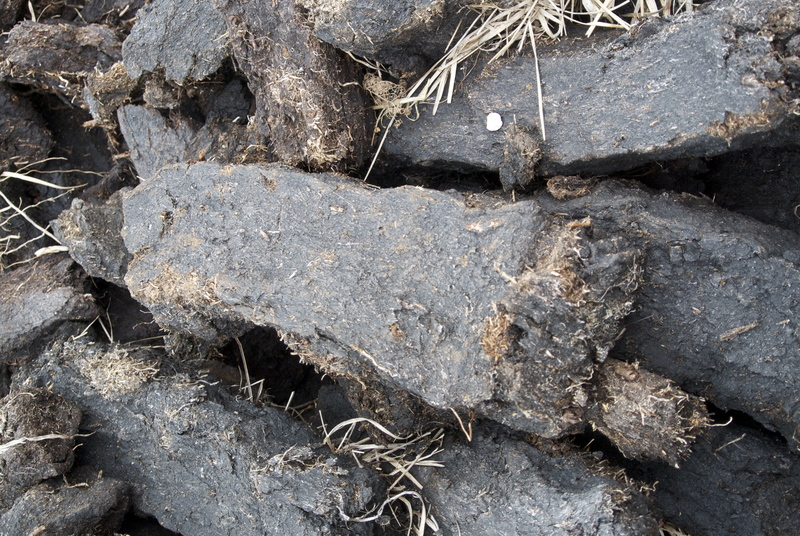 For peat’s sake, why? A tour bus has 4½ seats suitable for touring, and one of those belongs to the driver. That leaves 3½ seats for the tourists to scramble for. All of them are in the front row. From there you get an unobstructed view of the world coming toward you with its hands full of treasures. The half seat is the one in the front row directly behind the driver. You can still see quite a bit, just not directly ahead because directly ahead you see a head. All the seats that follow provide you with half a tour. If you do right-sided touring, you see the world right, but you can’t see what’s left. 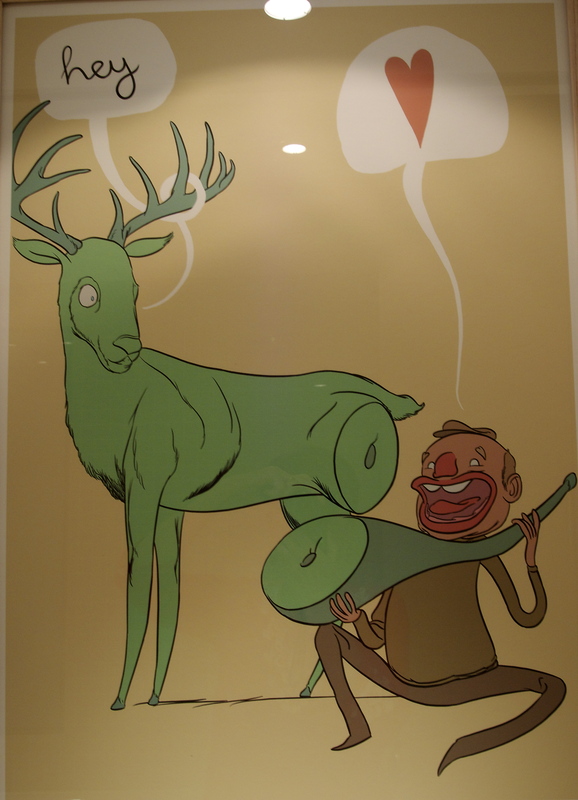 Conversely, if all you see is left, you don’t see things right. Tuesday morning we ate an early breakfast in our Killarney hotel, filling up on butter-slathered scones, and then hurried over to the tour bus stop to make sure we got the front seats. 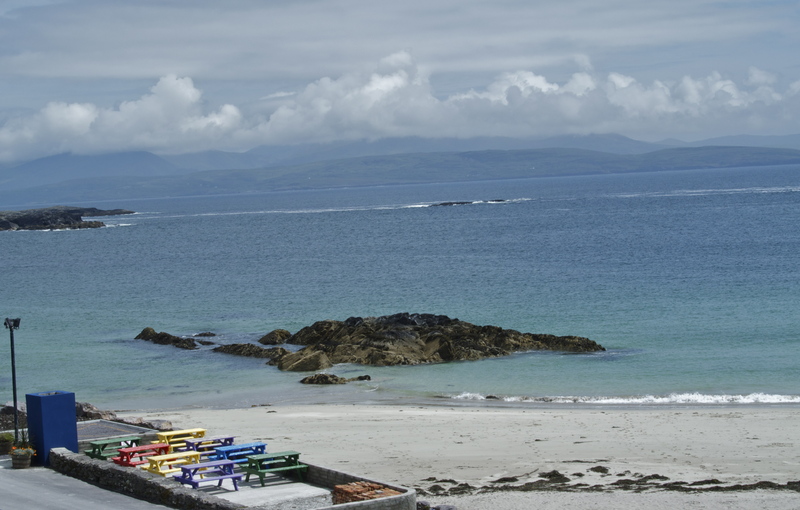 Our route: the Ring of Kerry, a 105-mile drive around the Iveragh Peninsula. Our direction: clockwise, the direction all tour buses take because buses can’t pass one another on the one-and-a-half-bus-wide roads. Did turf-cutters get bogged down sometimes by having to repeat the same job all the time? 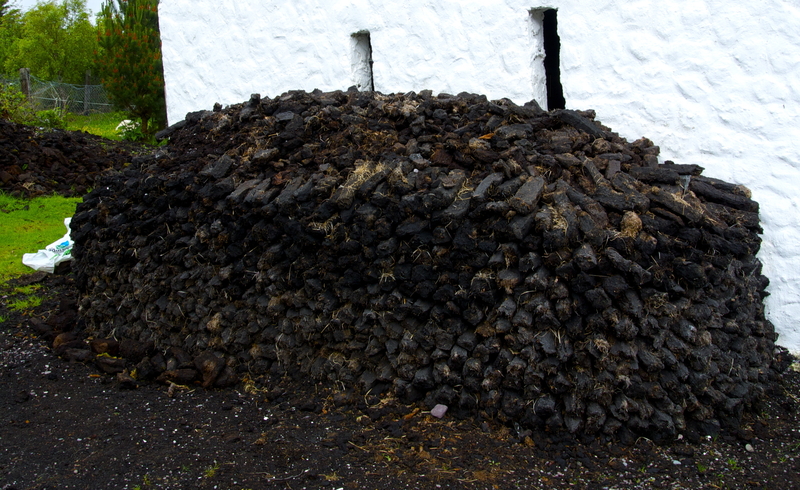 But back to the Bog Village Museum in Glenbeigh. It consists of a small village founded by a turf-cutter (peat gatherer), Jeremiah Mulvihill. The six furnished buildings depict life in the early 1800s. On route to our next stop, the driver gave us the option to stop at a sheep-herding exhibition. “The best five euros you’ll spend in Ireland,” he said. I raised my hand ”yes,” confident that all the others behind me would do the same. After all, each of us paid hundreds if not thousands of euros to travel to Ireland, and this was only five euros. A few pushy ones barked out “no,” and the rest, sheep-like, agreed, so we didn’t stop. I still snarl every time I think about it. The Atlantic Ocean crashes onto the beaches all along the western coast we traveled, and the MacGillycuddy Reeks (“black stacks” mountains) stand in the middle of the peninsula to watch. Carrantuohill mountain sees the most because it’s the tallest (about 3400 feet) in all of Ireland. I struggled to keep the views from taking away my breath, but lost. 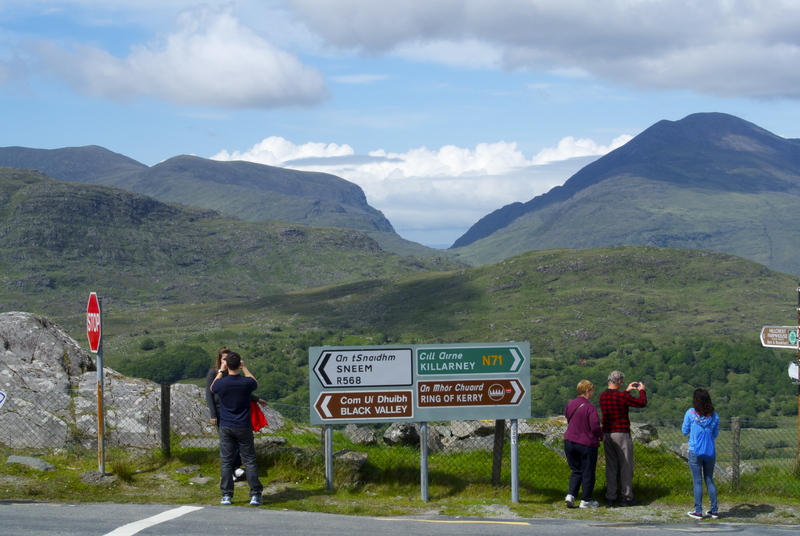 We returned to Killarney via Moll’s Gap named for Moll Kissame (a great last name for an Italian: What’s your name? Kiss-a-me), who ran a pub and quenched the thirst of travellers in the early 1800s. She also put the shine in the moon, if you get my drift, with her homemade, unauthorized whiskey. She definitely left a gap when she died. A tourist shop now stands in place of her pub. Mind the Gap; Moll did. 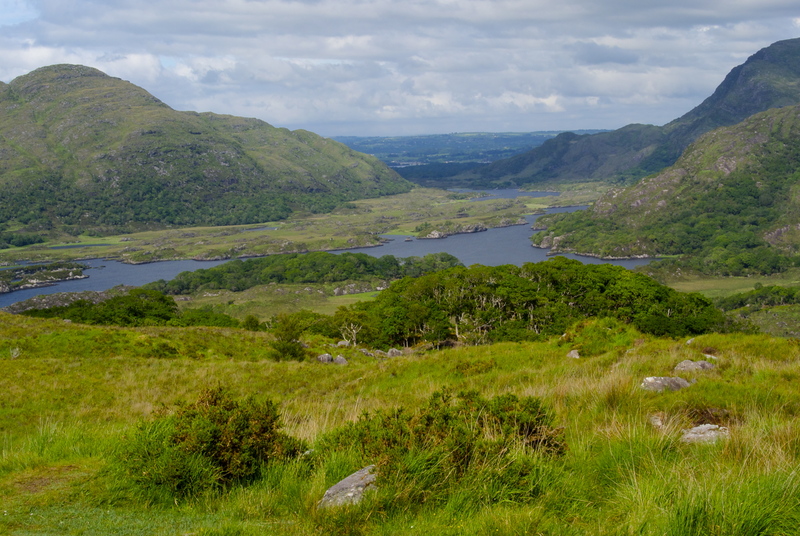 We stopped once more before returning to Killarney at Ladies View, a scenic spot providing a panoramic view of the Killarney Lakes. Apparently it remained nameless until 1861 when Queen Victoria, then sovereign of all of Ireland, visited the lakes with her ladies-in-waiting. 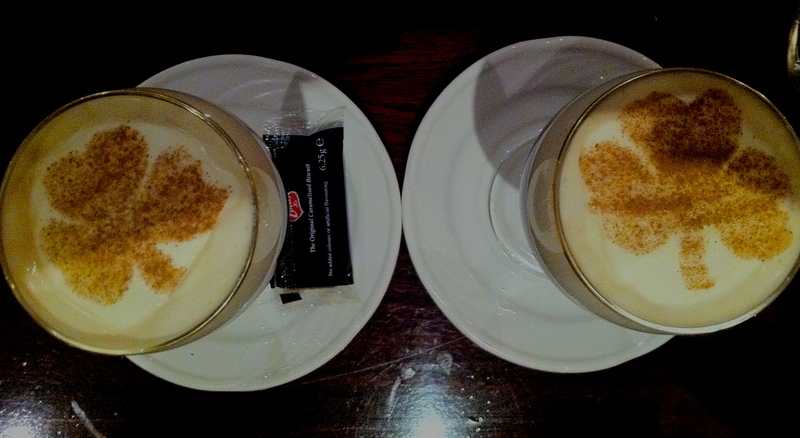 We didn’t find any four-leaved clover on the tour, but we found shamrocks in some Irish coffee. I drifted off that night under moonshine, wondering if Moll served that kind of coffee to her customers. Next installment: The end is near! Seeing Ireland by train is like that but only in the sense that you see a lot of the same things. What you see keeps you wide awake: hill after hill of rolling green, intense rain-drenched green; sheep moving across the fields like small fallen clouds; wind-sculpted rocks and boulders; castles and ancient ruins who stand guarding the past, grey, grim-faced, and fearless; flowers as wild as any you have ever seen; and fields of horses. If you’re from Ireland, or have been in Ireland, or know anything about Ireland, you know that horses play an important part in Irish history and culture. I, on the other hand, did not know that. You would think that someone with a great-grandfather from Ireland would know a wee bit more about the Emerald Isle. The explanation: one part of me is Irish; the other part is pure ignorance. 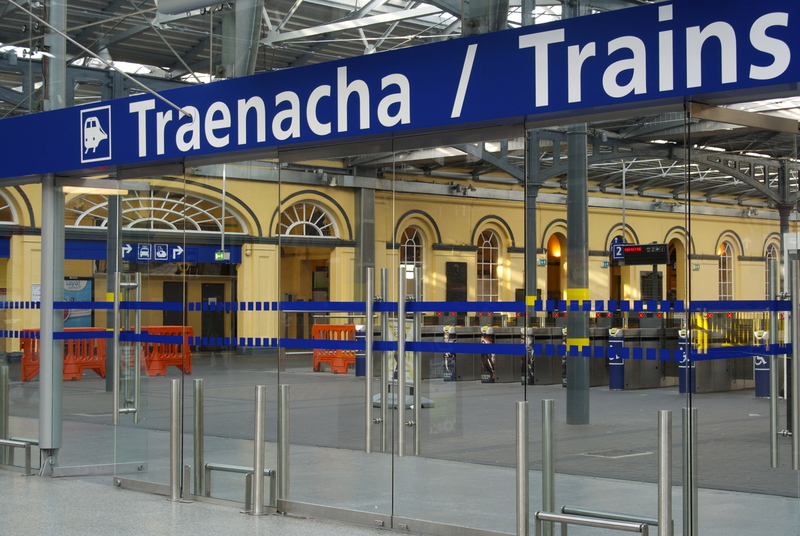 On our first day, we traveled from Dublin’s Heuston train station to Cork in the south. We passed nearby Templemore in County Tipperary where my ancestor came from, or at least emigrated from. He landed in St. Louis, Missouri, set up a grocer’s shop, and eventually produced a grandfather for me. Two men had to help me kiss the stone: a photographer who stood on my right, carefully blocking the view so no one else could get a shot, and a man on my left who sat in the ledge next to the gaping hole where the Blarney stone lies (possibly in more ways than one). To kiss the stone, I had to lie on my back atop a plastic liner. Obviously, at least to everyone who is not me, I shouldn’t have worn white pants. The kind man who had my back placed what I prayed were his very strong arms around my upper body and helped me scoot forward to grab the two metal rods running parallel to the wall. Finally, I lowered my head down, mercifully unable to see the now wire-thin rods protecting me from Mother Earth who beckoned me with a voice full of gravity. After one quick kiss, a peck really, I was pulled back up and gently pushed away so the next tourist could contribute to the Irish tourist industry. Since the official photographer stood in the only good spot for picture-taking, my only chance to get photographic evidence of the event was to buy the official picture. I did. However, when my brother kissed the stone, I held my camera over the shoulder of the back man, pointed it in the general direction, and got a fairly decent shot of him just before his lips made contact. It was a good thing I did, too, because in the official photos, my brother’s arm is blocking his face. My brother prepares to kiss the stone. I’ve never been so grateful for big hips. There’s no way they could fit through those rods. Now that I have kissed the stone, I have been granted “a cajoling tongue and the art of flattery or of telling lies with unblushing effrontery.” Don’t say you weren’t warned. From Blarney village, we took the bus to Cobh with a short stop to see Saint Colman’s Cathedral and a longer stop at the Cobh Heritage Centre. 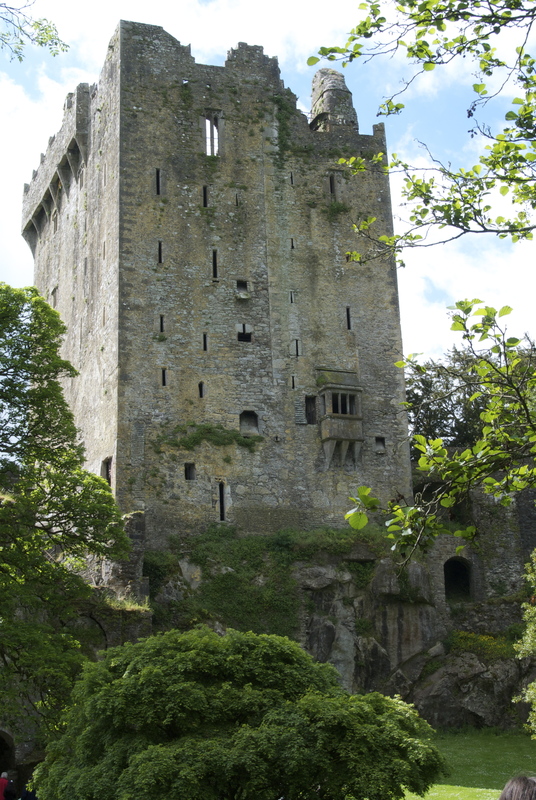 At Blarney Castle, you are tricked into thinking one kiss will turn you into a trickster, convinced by tricksters far trickier than you. But you walk away feeling good. Your heart feels lighter, and you don’t mind that your pocketbook does too. At the Cobh Heritage Centre, that light heart of yours gets broken. Cobh (called Queenstown until Ireland became the Irish Free State in 1922) was the last port people on the unsinkable Titanic ever saw, and the first port survivors of the Lusitania saw after being torpedoed by a German submarine. 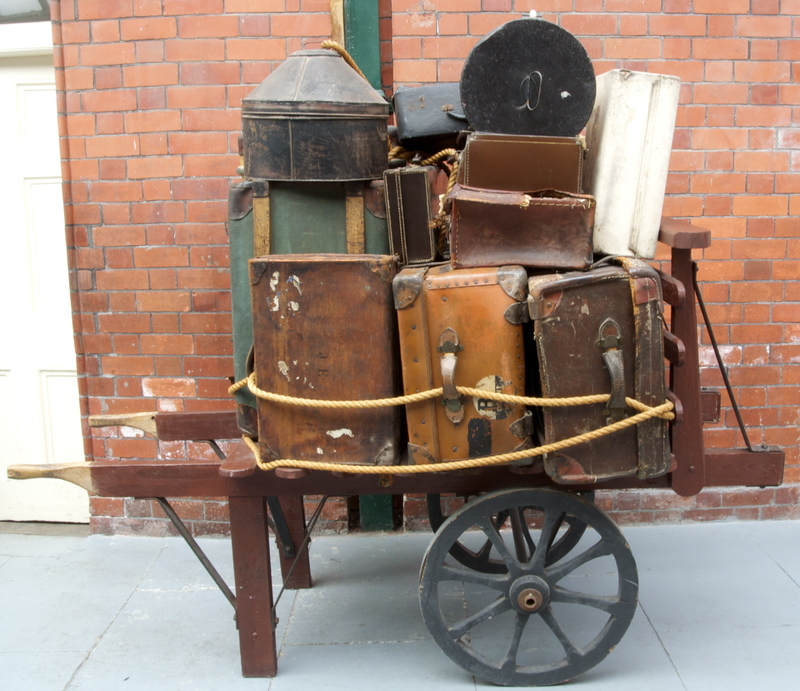 Inside the Cobh Heritage Centre: a million goodbyes. Even more sobering is the exhibition on the Great Famine and Irish Emigration. In the six years of the potato famine (1845-1851) one and a half million Irish left their homes to build new lives abroad. From then until 1950, about six million people left, almost half sailed from Cobh. 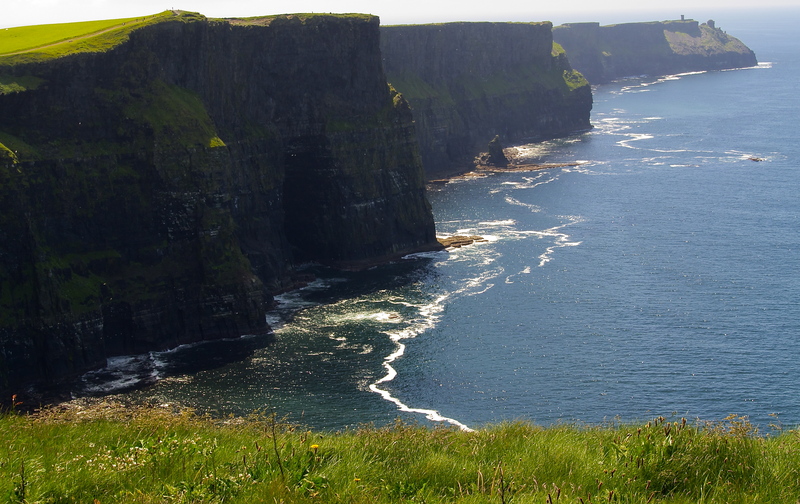 The pictures, videos, written accounts, and artifacts, all drawn deep from that well of sorrow called Irish history, tell a story that stays with a person. At least a person like me. 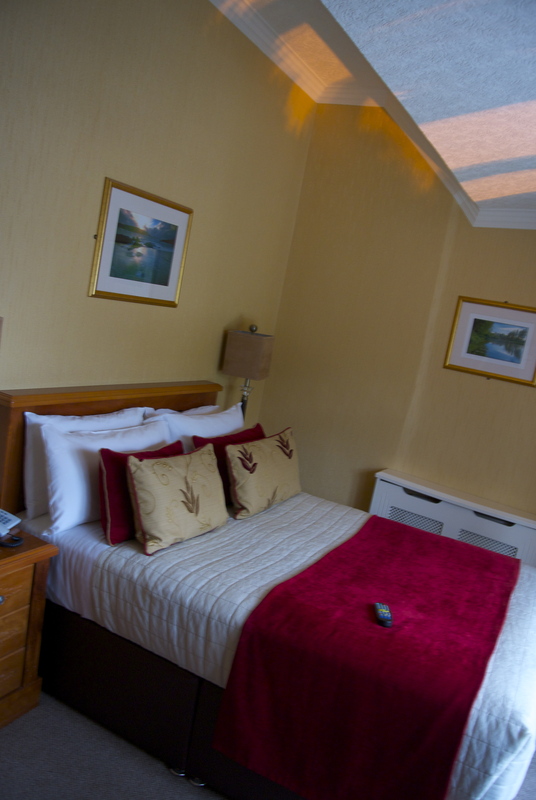 I practically slid out of bed every morning in our Killarney hotel. Imagine the weather as a blog. Day after day the weather posts something new, rearranging the clouds, sending winds first this way, then that; then one day it needs a break, and reblogs an earlier post. That’s what Dublin’s weather did the Sunday we were there. Instead of posting a summery June day, it reposted a day from March, an especially cold and rainy day that barely made it to double digits on the Celsius scale. It turned out to be the perfect weather for me. The night before our one day in Dublin, I had looked over the brochure for the Hop-on Hop-off bus and selected bus stop number 3 as my must hop-off must-see place to go. I was going to see the Book of Kells at Trinity College. No matter what. Life, of course, has a way of showing us what’s what. And sometimes “what” matters. Our “what” turned out to be Formula One: Bavaria City Racing. To accommodate and showcase F1 cars and other means of transportation that go zoom, the police cordoned off half the streets of Dublin for the small crowd of 100,000 people expected to attend. We waited until almost lunch to leave the hotel, and I dressed as warmly as possible with my I’m-pretty-sure-I-won’t-need-anything-too-heavy-because-it’s-summer-and-I-mean-how-cold-could-it-possibly-get clothing that I had carefully packed several hours before I left on vacation. Four layers later, I stepped outside and began the long, slow process of freezing to death. We took the tram downtown and waited in the cold for the bus. For a while I stood inside a telephone booth, but then we discovered we were waiting in the wrong place. Once we found the bus stop (the one without a phone booth), we made sure we were first in line. That way we could choose the best seats. Because brilliance runs in my family, both my brother and I thought it would be a good idea to sit on the top of the tour bus under the little roof. The one that doesn’t cover the entire top half. The one that lets cold wind blow down your neck and find your skin beneath the four layers of summer material. Surely, it would be heated. And we could see so much better. In a better world, a warmer world, a not-so-rainy world, it would have been a good idea. We thought we would have to scramble to get the front seats at the top, but oddly no one else went up top. But no matter, in just two stops from this first one, we would hop off and see the Book of Kells. Except we didn’t because we couldn’t. The bus had to go a different route and visit places out of order because the race cars needed the streets. So we sat in the cold, waiting to hear the driver announce stop number three, which was difficult to hear over the chattering of our teeth. We passed interesting stop after interesting stop and stayed put. Finally, when we stopped at Number 13, Guinness Storehouse, we got off. Just to warm up. Really. No, really. And we were hungry. So there. 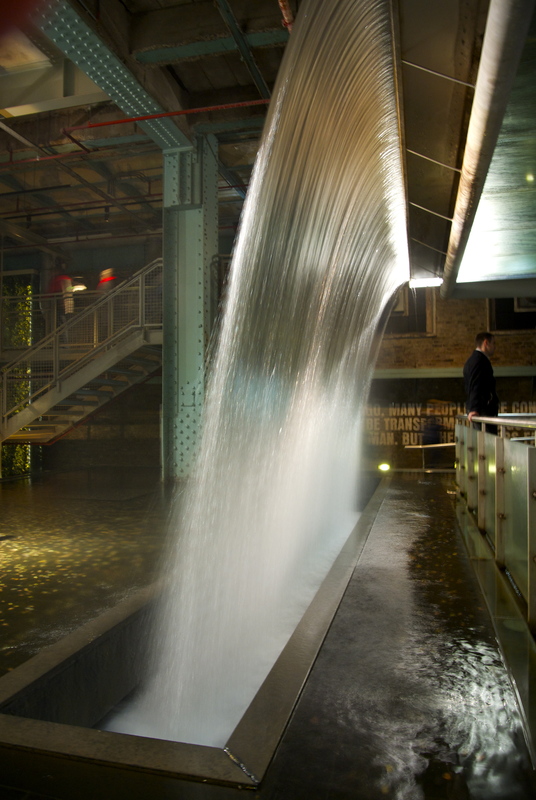 We spent a couple of hours exploring the seven-story building, learning the history of Guinness, and walking through a mock-up of the brewing process and cooperage (beer barrel building). 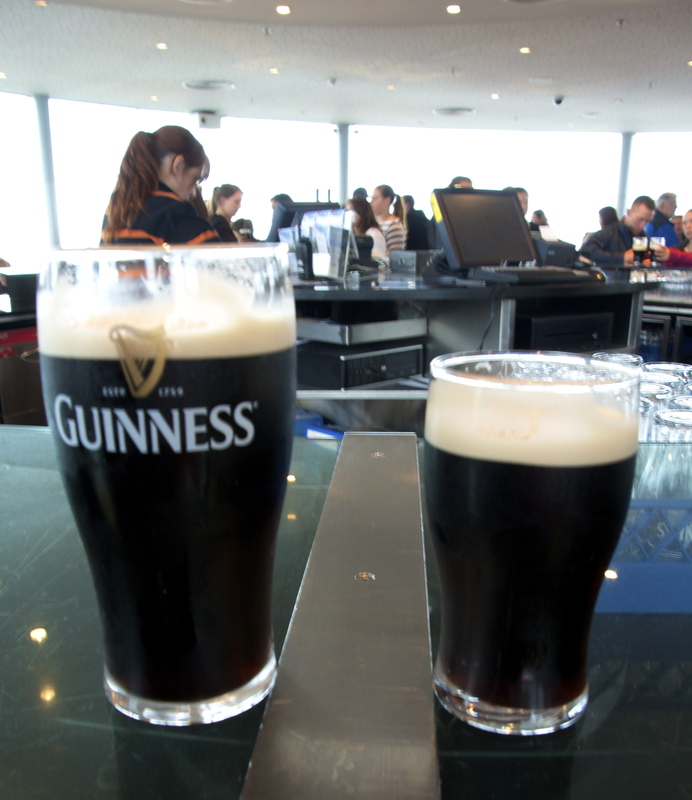 We took the glass elevator up to the top floor, the Gravity Bar,with its circular wall of windows that provide a panoramic view of Dublin, weather permitting. The weather did some intermittent permitting, but no one seemed to mind. Everyone there was enjoying a pint of Guinness, which is included in the price of admission. 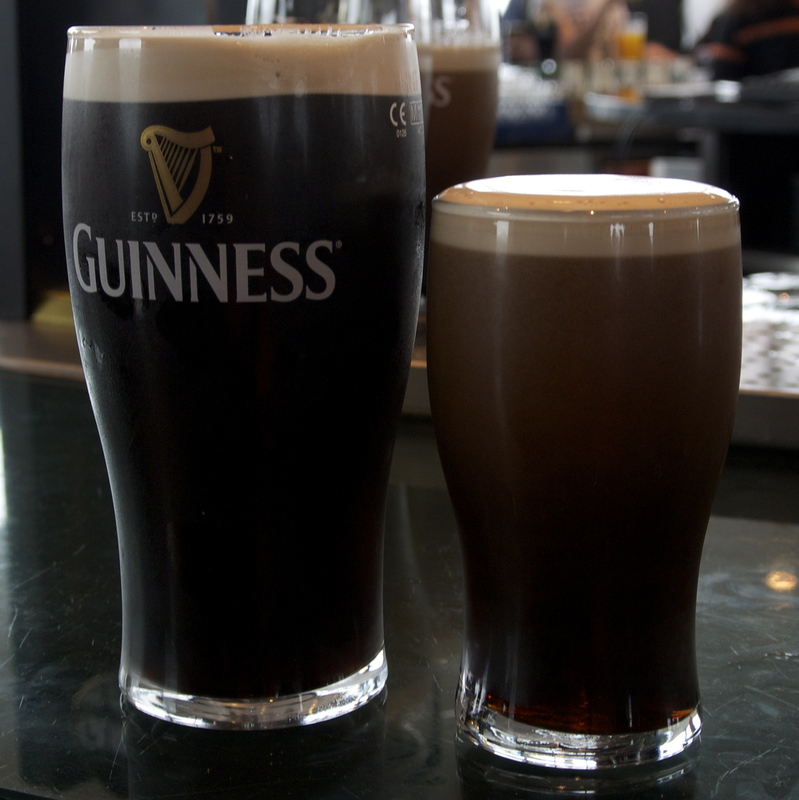 Hey, bartender, there’s a girl in my Guinness! 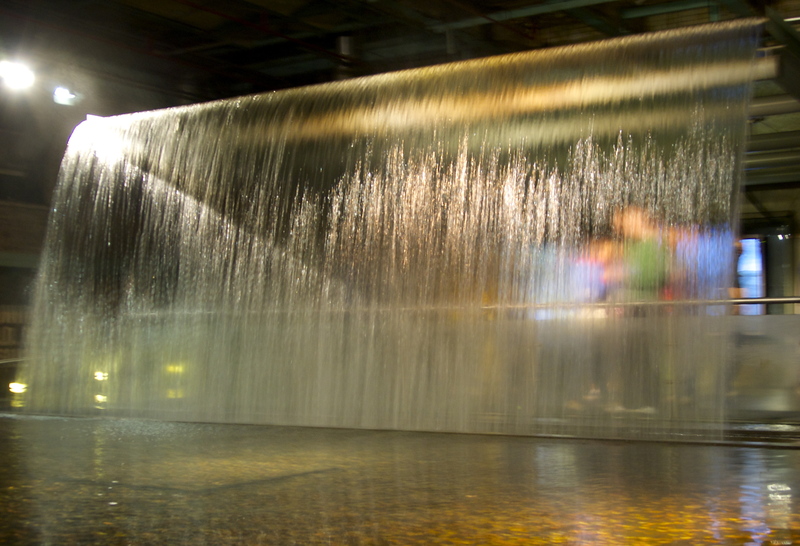 When my brother and I de-bused at the Guinness Storehouse, we discovered that the lower level of the bus had a surfeit of heat. While we had suffered up top, all the other tourists basked in the warm and cozy seats below us. To understand why we didn’t just move to the lower level right away would require more explanation than I can give you in just one blog post. Let me just say that one of the defining characteristics of my family is a determination and hardiness that looks vaguely like stupidity in a tuxedo. Normally, after any kind of disappointment such as not seeing the Book of Kells, I pull out my small dark cloud and place it over the center of my head, halo-like. But that day in Dublin, I decided not to do that. Why waste my time walking under a small dark cloud when I could walk under the big dark cloud over Dublin. It seemed friendly somehow, as if the entire city shared my disappointment, and I felt strangely cheered. Then again, maybe I felt strangely cheered by the Guinness. Our first two weeks in Europe as we traipsed through Budapest, Paris, and London, we scheduled our own days, lingering and loitering with abandon. We squandered mornings, wandered through museums as long as we liked, and generally stayed out of reach of the clock’s little hands. When we locked the door of the London apartment, we left that life behind. At London’s Euston Station, we abandoned our lackadaisical ways, forsook lingering and loitering, and took the vow of obedience that joining a tour requires. 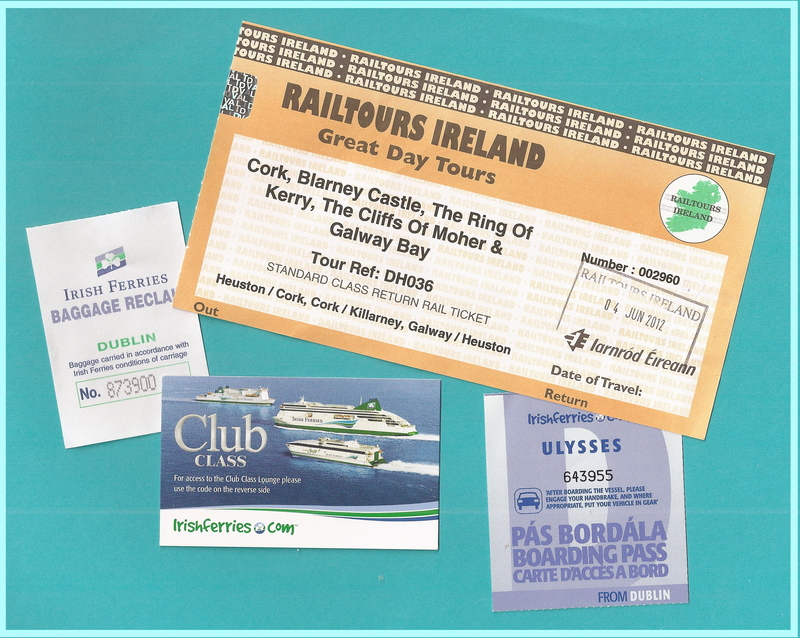 The cult we chose was Railtours Ireland. As far as cults go (and this one goes all over Ireland and back), they’re a good one. 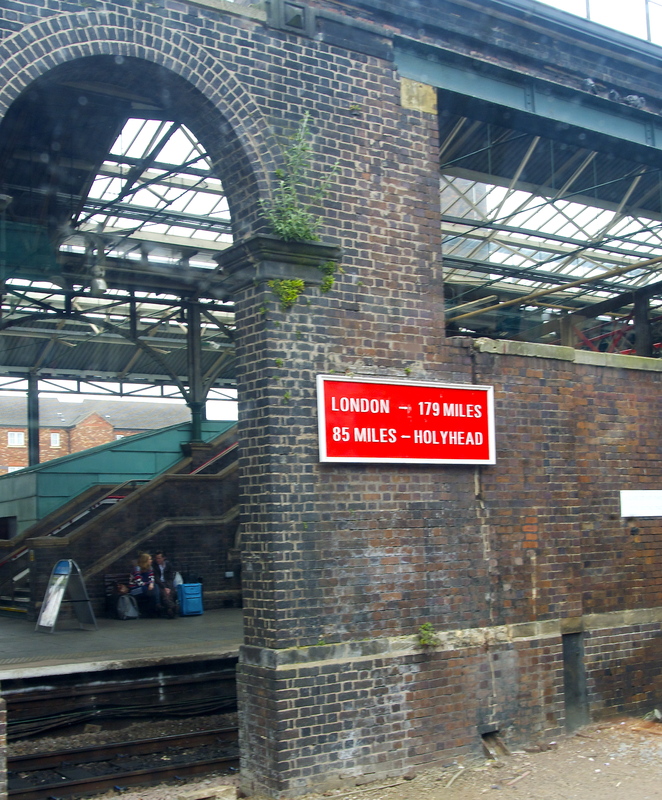 A yellow-vested representative met us at Euston station in London, handed us the information packet and tickets, and remained with us until the train left the station for Holyhead in North Wales. We saw beautiful scenery along the way, so I took a picture of a red sign. Sadly, our train did not stop at Llanfairpwilgwyngyllgogerychwyrndrobwillantysiliogogogoch Station, one of the longest place names in the world: Welsh for “St. Mary’s Church in the hollow of the white hazel near the rapid whirlpool and the church of St. Tysilio with a red cave.” (Amaze your friends by learning to pronounce it.) More sadly, the place name is not authentic Welsh, but a ploy to draw tourists to the place. And most sadly of all, this station really has nothing to do with my trip to Europe but does support my contention that the Internet should be called the worldwide warren because once you enter in, you find yourself heading down rabbit trail after rabbit trail. At Holyhead we boarded the Ulysses (Largest ferry in the world! ), reportedly decorated according to James Joyce’s book of the same name. If you’re like me, and I’m sorry if you are, you’re thinking, “What a novel idea.” We got on the ferry with what seemed like thousands of English tourists eager to celebrate the Queen’s Diamond Jubilee by going to Dublin, where it wasn’t celebrated. 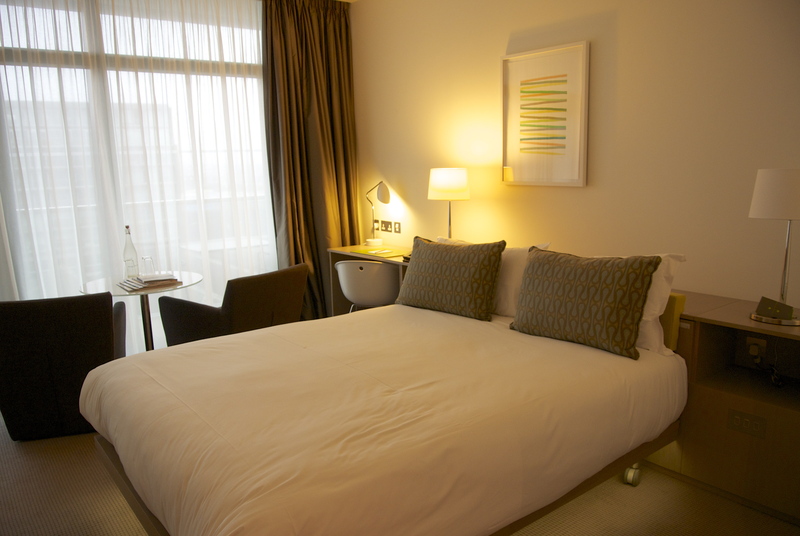 I practiced sleeping here for two nights in Dublin. 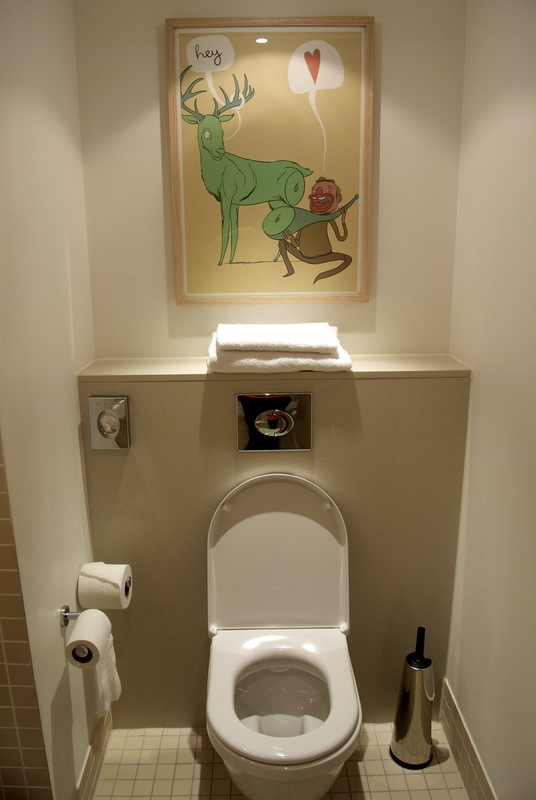 My bathroom in the hotel. The picture? I don’t know either. Was it meant to be endearing? The source of my strange dreams that first night? Our official rail tour would not begin until Monday. 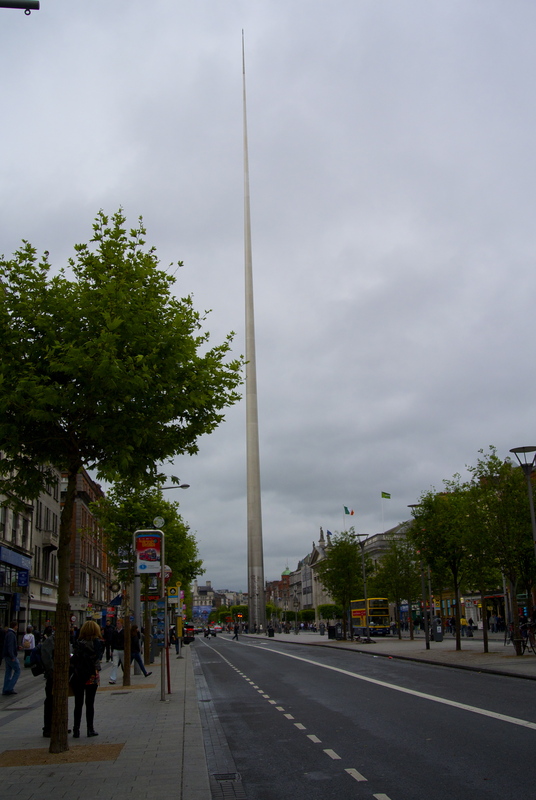 We arrived in Dublin on a Saturday, which left us Sunday to see some of Dublin. The tour package included a pass for the Hop On, Hop Off bus, so before I went to bed I read through the brochure and selected the one stop where we had to hop off. No matter what. What the heck is opprobrium? On our vacation, we had a hard time distinguishing between breakfast and lunch. Other than the difference in spelling, they seemed a lot alike. We spent all our mornings trying to tell where one ended and the other began. So on our fourth full day in London, we waited until we knew for sure that lunch was over before we headed out. Destination: Windsor Castle. Tickets: purchased months in advance. Cameras: all batteries charged, correct settings optional. By the time we got off at Windsor & Eton Central station, we had worked up an appetite from the exhausting hour-long train ride, so we stopped at a café for a drink and a morsel. All was well, too well, too idyllic, too perfect. Something was missing, something like an emergency, something like leaving the tickets to the castle on the table in the apartment. What Windsor Castle would look like from the village if there were no sky. As we walked to the castle from the café, I castigated myself, flogged myself with all my past failures, declared myself unfit for vacationing, and prepared my pocketbook to pay the entrance fee – again. Apparently ordering them once online was not enough for me. Unable to reach abject despair and a sense of worthlessness by myself, I begged my brother, daughter, and granddaughter to heap opprobrium on me. They refused, partly I believe because they had no idea what it was. While I was standing in line at the castle entrance huddled beneath my personal small dark cloud, my more rational daughter flagged a worker and told her our dilemma. She directed us to the counter where a young woman smiled about the forgotten tickets, said it happened all of the time, and swiftly found my information in the computer. Already paid. My pocketbook rejoiced; I took back all my flogs, uncastigated myself, and proceeded to have a jolly good time. Visitors are not allowed to take pictures inside the castle, at least with cameras, but I took pictures inside of my head of Queen Mary’s dolls’ house, along with the paintings, tapestries, armor, and woodwork in the areas of the castle open to the public. One current exhibition showcased sixty photos of the Queen representing her sixty years as monarch. Go to the royal collection here to see them. As striking as the architecture and furnishings were, I was struck by the thousands of gleaming weapons displayed on the walls. Not literally struck, of course. But in room after room, swords and guns formed herringbone designs up and down the walls, and spears and halberds were crisscrossed into patterns that looked as if they were created to be decorations. The beauty and craftsmanship of the weapons adorning the castle almost made me forget they were instruments of war and death. A hundred years from now I wonder if we will have disarmed nuclear missiles artfully arranged in the gardens of government buildings, with groups of tourists strolling by snapping pictures of them. 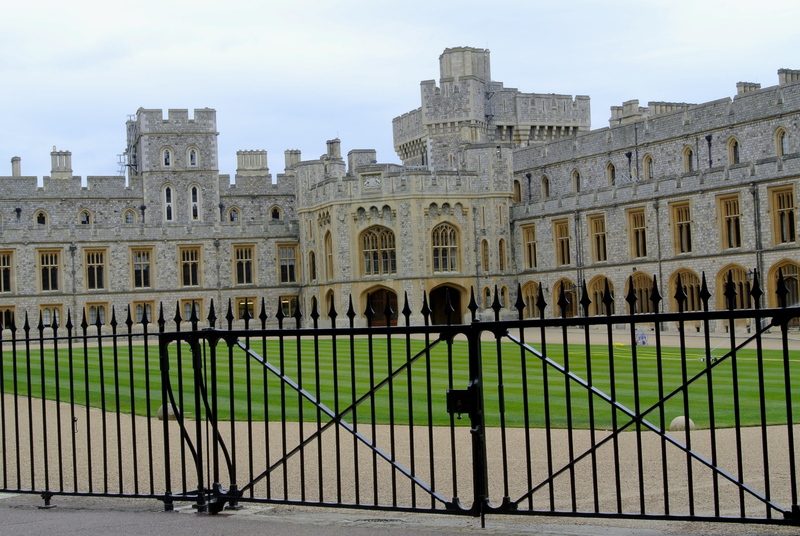 Unfortunately, I can’t offer any inside pictures of Windsor castle and few are available online, but it you want to see virtual tours of three of the rooms, go to the official website of the royal residences. Equally unfortunate, I can offer pictures of the outside, and I have made them available online. When I initially booked the tickets, I had no idea the Queen would be in residence that day. Normally she stays at Windsor on weekends; we visited on a Thursday. Perhaps she was resting up before her Diamond Jubilee the following week. 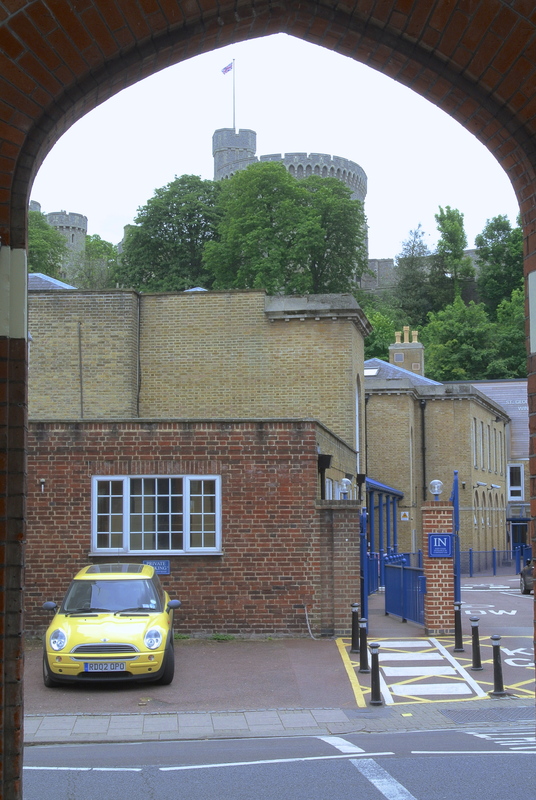 On hearing that the Queen was at Windsor, the grandchild felt confident that she would invite us in or at least come out to say hello when we stood outside the gate in front of her apartments and waved. She must not have seen us. We left feeling just a tiny bit dejected. The Queen was in one of these rooms not looking at us as we waved. Even though the grandchild interacted with PIGEONS! throughout the day, enjoyed the train rides, and partook of the chocolate consolation, that night the little one suffered a bout of homesickness. Two weeks is a long adventure for a five-year-old. We scheduled the last full day in London for shopping, even though none of us planned to buy much. My brother headed out to some camera shops, while my daughter, grandchild, and I took the Tube to Oxford Street. It may surprise you to learn that after walking around an hour or so, we stopped for a small repast. When we met up with my brother, my daughter decided to go with him because the grandchild and I wanted to ride on a double-decker bus. 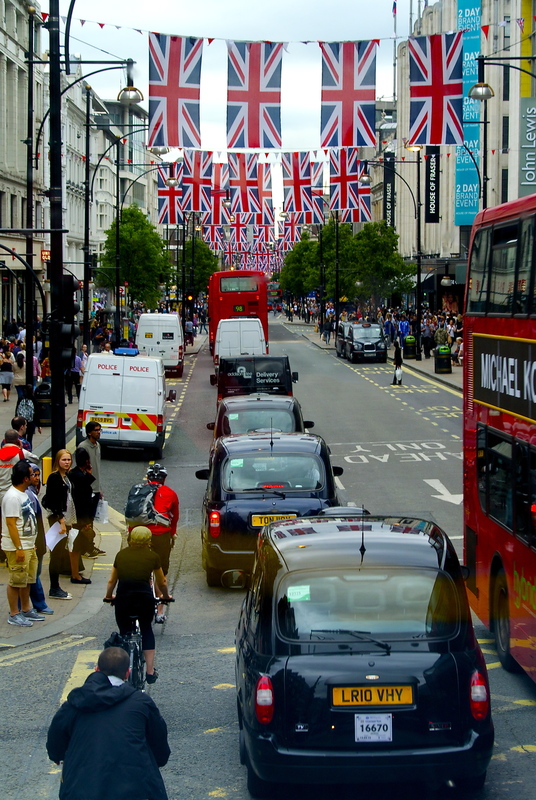 We rode down the street, got off many blocks later, then got on the Tube and went back to Oxford Circus station, so we could once again ride in the top in the front seats all the way back to Notting Hill station. On the way back to the apartment we bought a meat pasty and a chicken pie for dinner. Oxford Street seen through the glare of the window from the top of double-decker bus. That night, for the first time on vacation, we went to bed early because we needed to be up at 4:30 a.m. I set my phone alarm but I needn’t have worried. At 3:30 someone full of cheer and beer walked down the street behind the apartment singing at the top of his lungs. At 5 a.m. my brother and I said goodbye to my daughter and grandchild; then two hours later, our ride came to take us to Euston Station. The train carried us across the British countryside to Holyhead on the west coast where a ferry waited to take us to Dublin, Ireland.